For the Christian, life blood has a very important place. Actually, it is more than important. Like the heart, without it there is no life at all. First, life is in the blood. As we learn in The Making Of A Blood Covenant, blood represents life. Often we think of blood in the aspect of death. If a person or animal loses too much blood they die, but the Bible looks at it more from the perspective of life. To lose blood is to give life. This is the idea behind "blood brothers" and blood sacrifices. It is even the idea behind cannibalism [as evil as that is]. The false belief of cannibalism is that as one consumes the enemy he absorbs their life. Second, we know that in the Old Testament they had animal sacrifices. Sin is a deadly murderer and the only way to deal with it is through the giving of innocent life blood. The blood of an innocent animal covered the sin of the people for a year. As the Book of Hebrews points out, the blood of animals could never take away sin. It was only a temporary covering for sin until the Perfect Sacrifice came. Third, Christians recognize that the Blood of the Lord Jesus Christ is the only thing that can permanently take away sin. The life blood of animal sacrifices could not do it. By man sin had entered into the world and only through a Perfect Man voluntarily offering his life blood could sin be removed. No one killed Jesus, He offered His life on our behalf. He allowed His life blood to be split so that we could enter His life. It is only as we accept the Blood Sacrifice of Jesus - the only valid human sacrifice - that we can enter into relationship with God. When we accept Jesus as Lord and Saviour we enter into His death, thus have sin destroyed in our lives, and then we rise with Him and enter into His life. 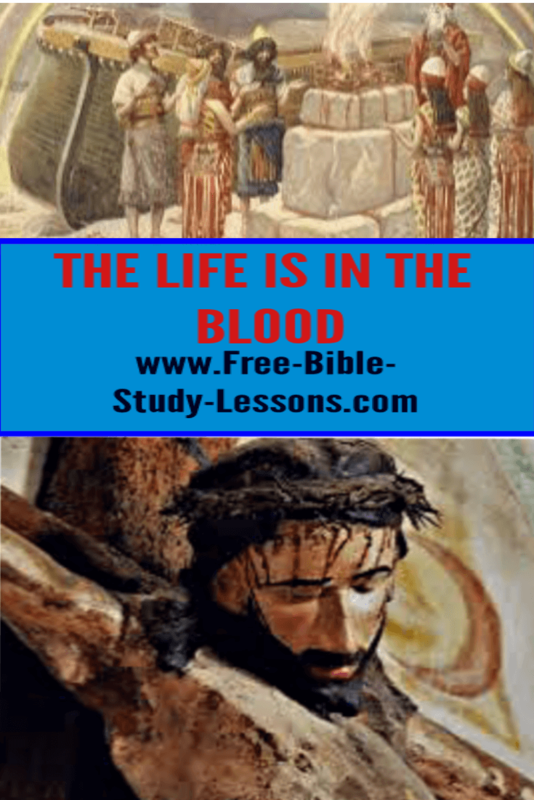 Since life is in the Blood, until we have the Blood of Jesus flowing through our veins in salvation we are dead. We speak of being dead in sins. It is true. All other religions are traps, none of them can offer life. It is important, as Christians, that we never loose sight of where our life comes from. We never mature so much we do not need the cross or need to hear about it. Everything we have from salvation to healing to victory to provision and more is because of the life Blood of Christ. Let us walk in His life and never be ashamed of or tired of hearing of the Blood of Jesus on the cross.